Research Interest: The primary goals are to design, synthesize, and evaluate novel ligands, with a particular emphasis on serotonin, nicotinic acetylcholine, and GABAA (benzodiazepine site) receptors. These ligands are needed to better understand a role of receptors in the treatment of neurodegenerative disorders, addiction, psychiatric disorders, and other disorders of the central nervous system. In addition, his research involves the developments of new synthetic methodologies that allow access to the desired compounds in a highly efficient manner. 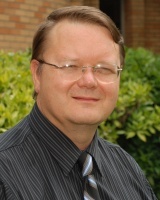 Dr. Bondarev is also engaged in collaborative studies with researchers in the USA and throughout the world. Ph.D. Synthetic Medicinal Chemistry, A.V. Bogatsky Physico-Chemical Institute of the National Academy of Sciences of Ukraine. M.S. Bioorganic/Medicinal Chemistry, I. I. Mechnikov Odessa State University, Ukraine. Visiting Scientist in the Department of Medicinal Chemistry at Virginia Commonwealth University, Richmond, VA.
Postdoctoral Research Associate in the Drug Discovery Unit at Affymax Research Institute, Santa Clara, CA. Shibinskaya, O. M.; Karpenko, A. S.; Lyakhov, S. A.; Andronati, S. A.; Zholobak, N. M.; Spivak N. Ya. ; Samochina, N. A.; Shafran, L. M.; Zubritsky, M. Yu. ; Bondarev, M. L.Synthesis and Biological Activity of 1,2,3,4-Tetrahydroindolo[2,3-b]quinoxaline Derivatives. J. Pharm. Sci. Pharmacol. 2015, 2, 140-147. Glennon, R. A.; Siripurapu, U.; Roth, B.; Kolanos, R.; Bondarev, M. L.; Sikazwe, D.; Lee, M.; Dukat, M. The medicinal chemistry of 5-HT6 receptor ligands with a focus on arylsulfonyltryptamine analogs. Curr. Top. Med. Chem. 2010, 10, 579-595. Sikazwe, D.; Bondarev, M. L.; Dukat, M.; Rangisetty, J. B. Roth, B. L.; Glennon, R. A. Binding of sulfonyl-containing arylalkylamines at human 5-HT6 receptors. J. Med. Chem. 2006, 49, 5217-5225. Pullagurla, M.; Siripurapu, U.; Kolanos, R.; Bondarev, M. L.; Dukat, M.; Setola, V.; Roth, B.L. ; Glennon, R. A. Binding of amino-substituted N1-benzenesulfonylindoles at human 5-HT6 serotonin receptors. Bioorg. Med. Chem. Lett. 2005, 15, 5298-5302. Glennon, R.A.; Bondarev, M. L.; Khorana, N.; Young, R.; May, J. A.; Hellberg, M.R. ; McLaughlin, M. A.; Sharif, N. A. β-Oxygenated analogues of the 5-HT2A serotonin receptors agonist 1-(4-bromo-2,5-dimethoxyphenyl)-2-aminopropane. J. Med. Chem. 2004, 47, 6034-6041. Bondarev, M. L.; Bondareva, T.S. ; Young, R.; Glennon, R. A. Behavioral and biochemical investigations of bupropion metabolites. Eur. J. Pharmacol. 2003, 474, 85-93. Rangisetty, J. B.; Bondarev, M. L.;Chang-Fong, J.; Young, R.; Glennon, R. A. PMMA-stimulus generalization to the optical isomers of MBDB and 3,4-DMA. Pharmacol., Biochem. Behav. 2001, 69, 261-267. Khorana, N.; Bondarev, M.; Dukat , M.; Herrick-Devis, K.; Egan, C.; DuPre, A.; Smith, C.; Teitler, M.; Glennon, R. A. Binding of spiperone analogs at 5-HT2A serotonin receptors. Med. Chem. Res. 1999, 9, N9, 657-667. Westkaemper, R.B. ; Runyon, S.P. ; Bondarev, M. L.; Savage, J. E.; Roth, B.L. ; Glennon, R.A. 9-(Aminomethyl)-9,10-dihydroanthracene is a novel and unlikely 5-HT2A receptor antagonist. Eur. J. Pharmcol. 1999, 380, R5-R7. Young, R.; Bondarev, M.; Glennon, R.A. An examination of isomeric phenylpropanolamines in (-)ephedrine-trained rats. Drug Alcohol Depend. 1999, 51, 1-6.